Using the color gray in your bathroom is actually something that has been popular for quite some time now, but mostly as a neutral color, to help grab attention to other colors in the mix. However, lately we’ve been noticing a turn in trends, where gray is being used as the primary and focal color point of a bathroom, and we must admit, it’s absolutely gorgeous! You would never think that using so much gray in a home bathroom would look so calming and soothing, but in actual fact, it really brings out that natural and home spa vibe to space. 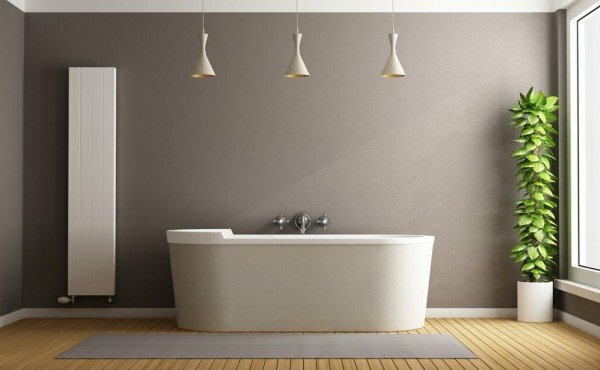 The trick that you need to keep in mind when working with the color gray in your bathroom is that you want to try your best to help counterbalance its coolness so that it doesn’t end up feeling like you’ve created an institutional and sterile environment in your home. You want it to feel homey, soft, gentle but also bold, striking and warm. It sounds complicated, but it really isn’t as hard as we’re making it sound, you need to simply add in some wooden shades, or choose a gray that is much more on the warmer side of things. 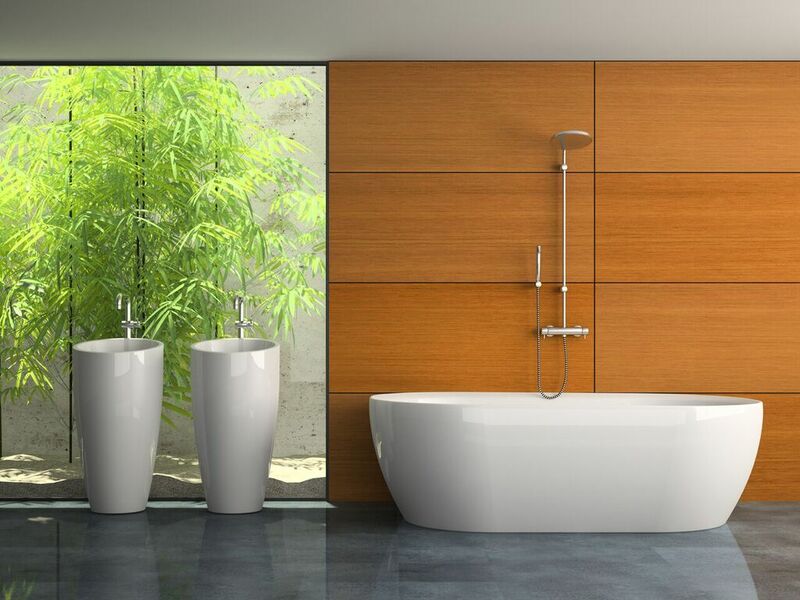 Having a gray bathroom when you live in a country with an extremely hot environment can actually be super soothing and relaxing, especially if you work some natural greenery into your bathroom, together with all those fifty shades of gray. 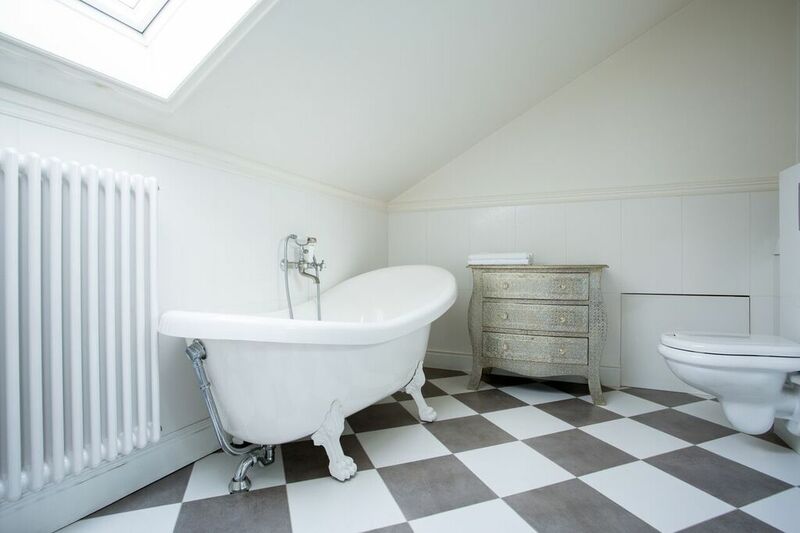 We love how this bathroom has a soft, elegant flow to it, with the freestanding claw foot tub sitting under the skylight, there is a ton of natural light that flows into this space, instantly giving it a much bigger feel and look. The cleverly laid, gray tiling works gorgeously in this space, adding that small touch of bold gray attraction to the room, without needing to bring too much gray into the picture. This is to die for! 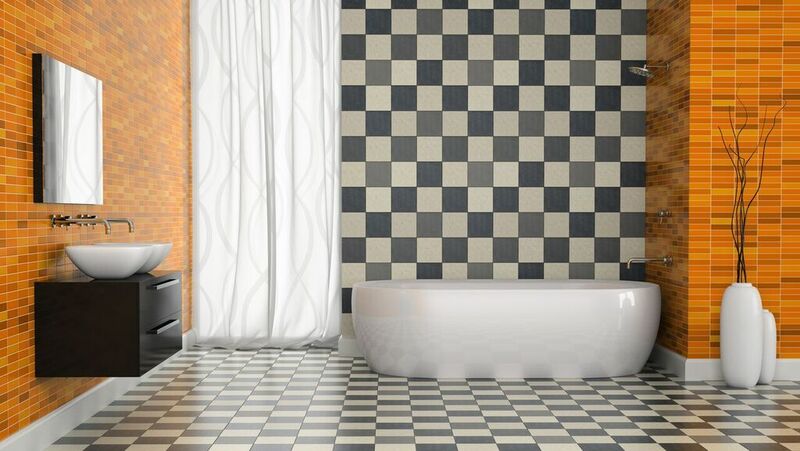 The mixed matched gray tiling, which is being used in various shades of gray, is cleverly tiled over the entire floor, and then only up to the wall behind the freestanding bathtub, making it stand out as the statement piece of the bathroom! We love how beautifully in contrast the gray is, in comparison to the burnt orange tiling, which almost looks like a yellow wood. Adding in a wall mounted vanity in a much darker wood color is also a great idea to blend all the colors together. This selection of colors in your bathroom is undeniably going to make it feel like a far away, forest bathroom retreat! There are so many different ways you can use the color gray in your bathroom, including natural greenery and wood that we just couldn’t resist the urge to show you all three of these fabulously designed bathrooms, using gray, greenery and wood as its main focus, yet somehow the bathtub and vanities stand out as focal points as well – talk about perfect blending! This first one is subtle, calm and tranquil, with a lighter shade of gray used on the wall of the bathroom, with the large, freestanding bathtub in an off-white color as the focal point of the bathroom, and natural light flowing straight in next to the luscious green plant on the right, you’ll have the perfect combo of gray, green and wood! The second bathroom using the same color scheme of gray, wood and greenery, but in a completely different way. With the gray being on the floor of the bathroom and not the wall, it feels a bit more cheerful than the last bathroom. Using a huge window and the colors of the natural green trees growing outside, look stunning right next to the bright wooden backsplash used behind the freestanding bathtub. The third gray, green and wood schemed bathroom, uses a much, much darker shade of gray, as well as a darker shade of wood. 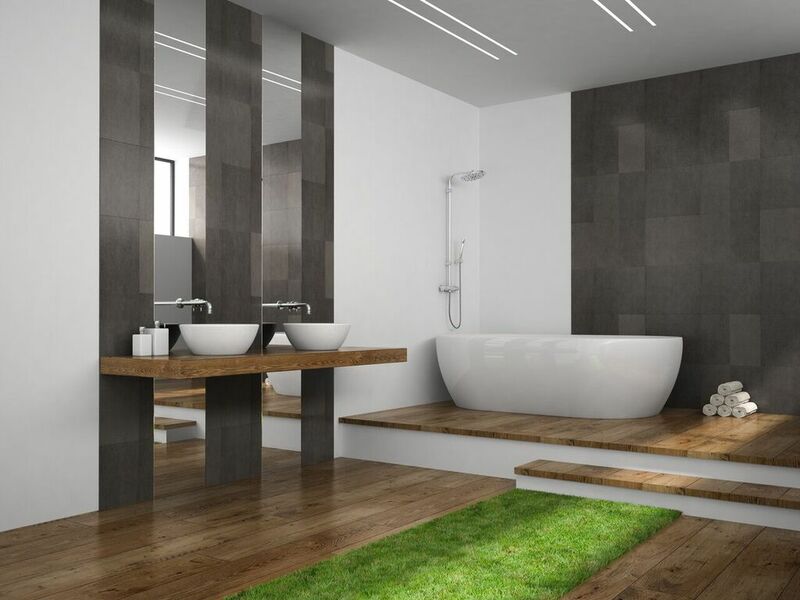 However, with the use of bright white walls, and long, big mirrors, it doesn’t seem so dark and deep as you would think, and with the addition of a faux grass mat running across the floor, you instantly create a unique forest feel to your bathroom. In conclusion, gray is actually a pretty fabulous color to use in your bathroom, especially if you’re looking to create a retreat of peacefulness and soothing calmness!